Capitalizing on our vast industrial experience of more than two decades, we have emerged as an eminent Hot Melt Coating Machines Manufacturer, Supplier,and Exporter of Indian domestic market. We design and manufacture optimum quality ambit of High Speed Hot Melt Coating Machines for our valued clients. Manufactured at our state-of-the-art manufacturing wing, these high-end coating machines are best-known for their easy installation & use, rust resistance, performance and longer service life. These machines are fabricated with the help of sophisticated technology and high-grade tools & other material obtained from the authorized vendors of the industry. In this process Hotmelt can be coated in single side of the substrate. The coating thickness should be 16 - 22 gsm. +/- 3 gsm. Three-roll Coaters have following stations. Machine Roller width is 1200 mm. with coating width of 1000mm. 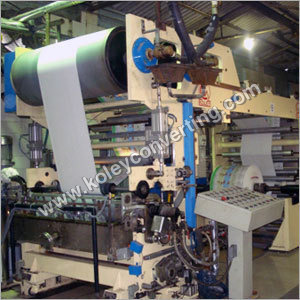 The machine is suitable for paper. Precision adjustments are incorporated for control of Hot Melt coating thickness. Temperature to be maintained constant with PID Temperature Controller in the Hot Melt Tray for uniform coating. Copyright © 2012-13 by KOLEY CONVERTING MACHINERY PVT. LTD. All Rights Reserved.